Here we have it, the first post from a contributor. This one comes from a good friend of mine, Alex, who can give a better perspective on the Oklahoma State uniform situation. He attended the school for two years for grad school. Here is his deeper view on the Cowboys’ recent uniform changes. Before the 2006 NCAA football season, the University of Oregon unveiled its 384 different uniform combinations that would forever change college football. Call it jealousy, or just an overwhelming desire to be the same as their peers (a character flaw that is prevalent in our society), but since then, other college football teams have decided the simple distinction of “home” and “road” uniforms were obsolete. This has led to a rash of teams trying to outdo (see Arizona State) or out-weird (see Maryland) other teams. That brings us to my alma mater, Oklahoma State, who, backed by seemingly unlimited funds from oil-tycoon-turned-wind-power-guru T. Boone Pickens, unveiled a uniform combination that, while not as egregious as Oregon’s, is still nonetheless perplexing. Using the Oklahoma State Combo Creator, fans can choose between four sets of pants (gray, black, orange and white), four different jerseys (gray, black, orange and white), and three different helmet colors (black, orange and gray). While some regard this as a way to put OSU on the map (as if an AP #5 ranking doesn’t do the trick), lost in the cornucopia of uni-combos is the idea that Oklahoma State (and arguably along with other teams), have lost their identity. You don’t have to attend grad school in Stillwater to know that the town simply loves orange. The color is as common as dandelions in the spring. At any and all OSU event, the cheer that is most common is simple: one side of the stadium yells “Orange!” while the other side attempts to outdo them by yelling back “Power!”. Students are not encouraged but expected to wear orange to games, and wearing any other color, no matter what the weather, makes one stand out (and not in a good way). 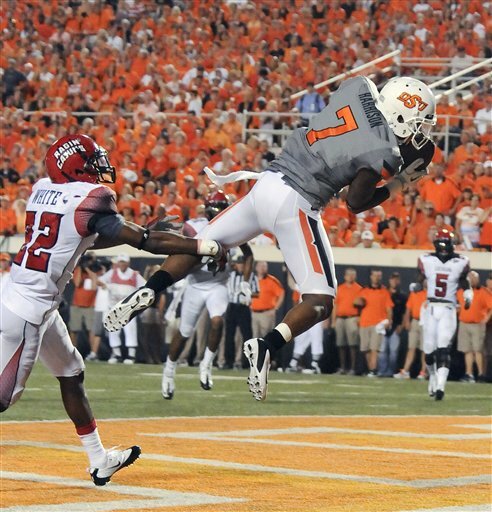 So, what is curious to me (and to perhaps many other OSU fans) is why Oklahoma State’s uniforms, with all their national attention, a Top 5 ranking, and an offense that can seemingly score points even while sleep, has yet to feature orange in 2011. Two seasons ago, Oklahoma State football debuted an all-black look for their Thursday night ESPN showdown with then-conference rival Colorado. The black jerseys and pants, coupled with white helmets with the black “OSU” were met with mixed results in Stillwater, but looked neat nonetheless under the lights in front of a prime time audience. But OSU followed the tradition of orange over white at home, and white over orange on the road that season, with the exception of their all orange look for Homecoming (which is, as advertised, the best Homecoming celebration in the country). 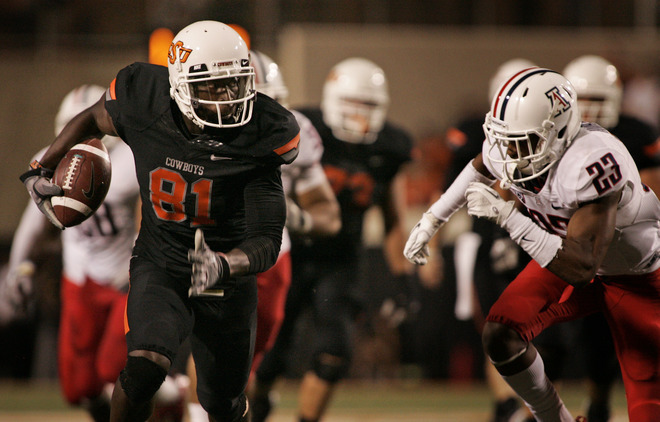 In 2010, OSU again donned the all-black getup for their yearly Thursday night game, this time against Texas A&M in a 38-35 thriller. Despite their 2-0 record in the black, OSU stuck with its regular road home combination. That is, until their game at Kansas, when they wore their road whites with black pants for the first time since 1994. And thus, it started. The idea that the orange and white simply was not good enough and that black and gray needed to take a more prominent role, giving birth to the highly questionable uniforms they sport in 2011. Let’s review: their opening game against UL-Layfette saw the debut of gray jerseys with white and pants and helmets. Game two, on ESPN’s Thursday Night prime time slot, featured the return of the all black and the white helmets. Their third game against Tulsa, played in the early hours of the morning thanks to Oklahoma’s signature tornado warnings (I actually survived a few when I was out there) saw the Fighting Gundys in white helmets and jerseys matched with black pants. The gray helmets and pants, matched with white jerseys, made their debut in College Station last Saturday against A&M. So, where’s the orange? Sure it’s in the numbers and trims, but that still doesn’t mean it’s featured. 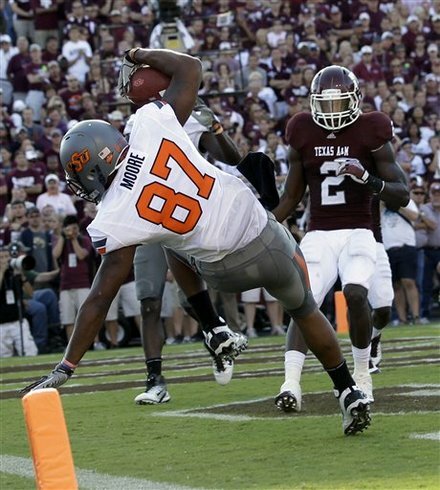 Even in what the Oklahoma press called Mike Gundy’s signature win, OSU’s signature color, orange, was hardly visible. Sure, new jerseys are great, and they certainly create a buzz for a program, but at what cost? A team’s mainstay is their uniforms, which in turn, helps to create their identity for fans, alums and a national audience. Besides, a team doesn’t need all kinds crazy uniform combinations to garner national attention. Just look at these two teams.